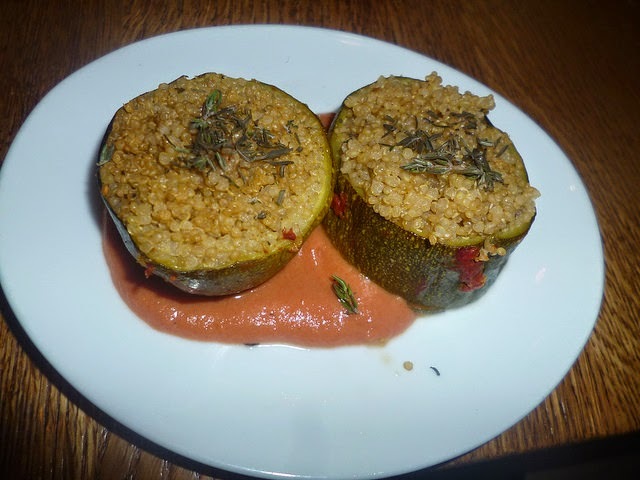 Forays of a Finance Foodie: Ellary's Greens: Proving That Eating "Green" Can Be Exciting! 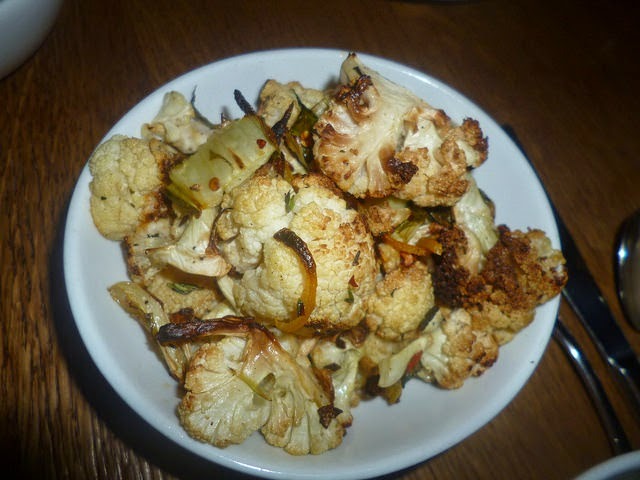 Ellary's Greens: Proving That Eating "Green" Can Be Exciting! Last week, I was lucky enough to try Ellary's Greens in one of the historic storefronts on Carmine Street (#33 to be exact) and I was dazzled by the super farm to table freshness of this 1 1/2-year-old eatery—which named after owner Leith Hill’s grandmother and great grandmother. The decor is quaint, with exposed brick walls, dim lighting, old-fashioned glass cases filled with healthy desserts, and high ceilings featuring an overlay of laser cut metal (the motif seems to be of leaves growing on stems, almost like a beanstalk). Each item on the menu is marked off as vegetarian, dairy free, gluten free or vegan, so if you have special dietary needs, they can take care of you. For extra fun, sit at the big wooden table in the front window that has a giant terrarium in the center!‎ The veggies and produce are sourced locally and vivacious owner Leith Hill--who was raised in a healthy household in New Orleans, which was probably an oddity at the time--says that her dad had a strong interest in the connection between activity and healthy eating since he was 12. So he raised his family with healthy substitutes for sugary snacks and other foods with empty calories. This probably accounts for the fact that the desserts here seem so rich and creamy, but they are made with almond flour and ground chickpeas--and the icing usually consists of whipped tofu or coconut cream. It is fun to start out with one of their fabulous juices or smoothies. I had The Lunatic ($7-$9) which features celery, cilantro, apple, cucumber, ginger and cayenne pepper and loved it—and maybe it was psychological, but I felt instantly energized! Leith told my dining partner Gail and I that that the Ellary’s Green staff are proud to know every farmer they get supplies from, and that she has been on some of these farms herself. Nothing comes from any further away than Pennsylvania and that includes the meat (she makes sure it comes from farms where animals are humanly raised and killed). You might be surprised that a health-conscious eatery serves red meat but Leith says that she does not want to scare away carnivore customers (which she says tends to be more men than women). As an appetizer, the restaurant's famous House-Smoked Deviled Eggs were brought out (you get two for $10). Ellary’s kitchen staff keeps a smoker downstairs and that's what gives the deviled eggs that distinctive taste. While this is obviously an item made easily enough at home, people flock to Ellary's for their smoky taste “because there is nothing quite like them” according to a regular customer. We had glasses of organic white house wine ($8) right afterwards and what Leith told us about it was true—you do not get a headache when there are no sulfates used! It’s cute how the wine is served in why I call “Italian grandpa” glasses instead of traditional wine glasses. 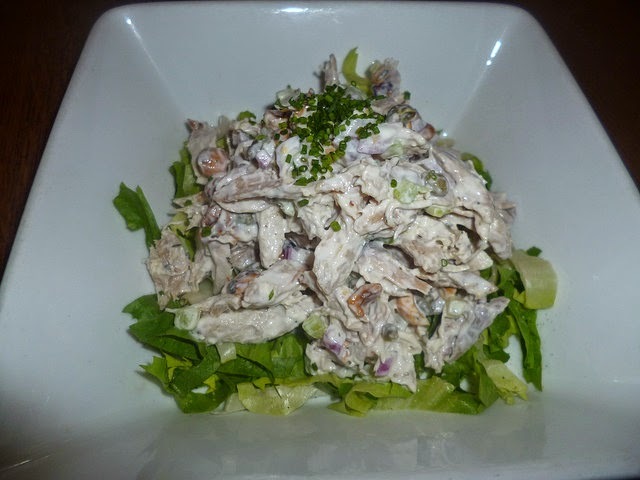 My Chicken Salad ($14) was terrific—the organic free-range white meat chicken was shredded and served with a homemade aioli dressing and then finely chopped hazelnuts, capers, red onions and lemon confit were folded in. The chicken was juicy and tender and the two-plus cup serving was extremely filling. I actually suggest this as an entrée because of how filling it is. As entrees, my dining partner Gail and I shared the Green Thai Tofu Curry ($15) and the Crispy Roasted Chicken Breast ($14). 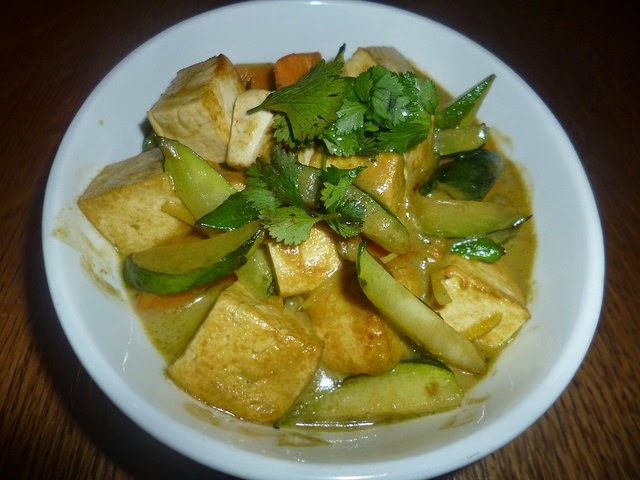 The Green Thai Tofu Curry’s creamy green sauce was made with farm fresh yogurt and had just the right kick from a bit of fresh ginger and of course, the curry. The organic string beans and sweet potatoes tasted fresh picked and the tofu was nicely cubed. The curry was served with a large bowl of brown rice.‎ The Crispy Roasted Chicken is served sliced (about 1” thick) and was so tender than not even a knife was needed to cut it—but the delicious golden skin was the part I really savored and ate slowly! There were some creamy pureed celery roots on the side. I was especially excited to try the farm fresh veggies. At Ellary's Greens, not much salt or pepper is used is used but you can ask for sea salt and a fresh pepper grinder for the table. Leith prefers her cook staff to flavor with herbs instead of salt and pepper because it's healthier and in her eyes, more flavorful. I tried the Roasted Cauliflower ($8) which really tasted like it was just picked and served very lightly herbed with thyme and lemon confit, and then the Lebanese Stuffed Zucchini ($8), which almost looked like two large veggie sushi rolls lying in homemade yogurt tomato sauce (they could easily be cut with a fork thanks to being stuffed with quinoa)! I also ordered the Yukon Gold Mashed Potatoes ($8), which included some Swiss chard and almonds in the mix and were creamy despite having no butter included in the recipe (the potatoes are whipped with olive oil). For dessert, I tried the Pumpkin Spice Cake ($8) with rich tofu whipped cream and the Chocolate Strawberry Short Cake ($8) with coconut cream icing. The sweetener used in these cakes is agave nectar. You would never miss the real whipped cream and confectioner's sugar that these desserts would be made with elsewhere--and you save hundreds of calories while savoring their goodness! 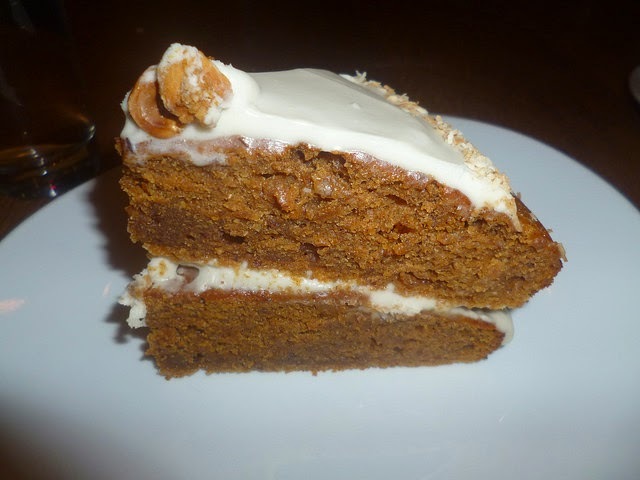 Ellary's Greens’ Pumpkin Spice Cake is a seasonal item (available only in fall and not necessarily printed on the menu) so you have to ask your server if it is available. I will definitely return to Ellary's Greens. ‎I like the personal attention of the staff and the freshness of the ingredients. I also love the fireplace in the back and hope to return in the winter months when they actually light it!